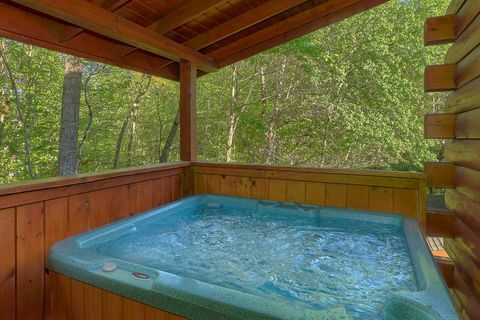 Come explore "Paws A While," a magnificent Pigeon Forge 4-bedroom cabin with pool access, hot tub, and lots more amenities that aim to make your Smoky Mountains family vacation one to remember! 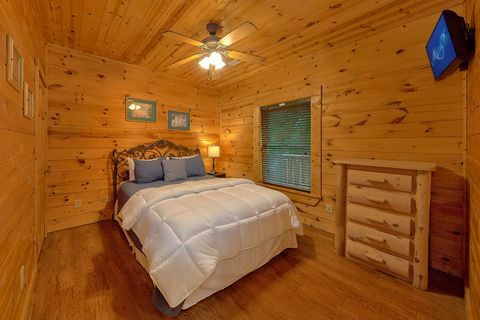 Your group cabin in Pigeon Forge rests close to Gatlinburg and accommodates up to 12 guests. 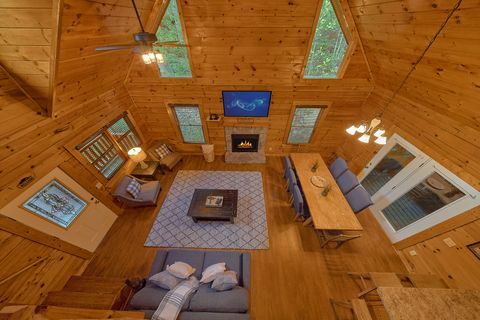 "Paws A While" provides a cabin for families and small groups looking to stay close to all the action and excitement the Smokies have to offer. 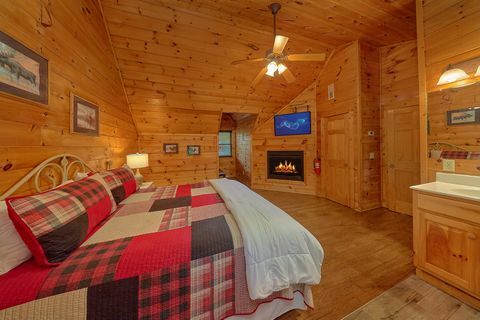 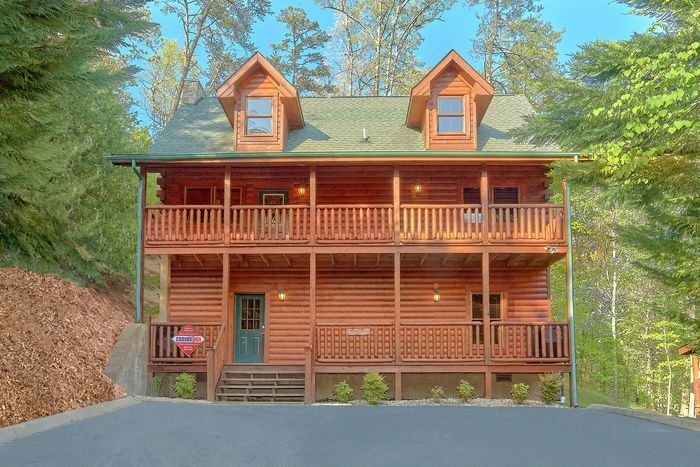 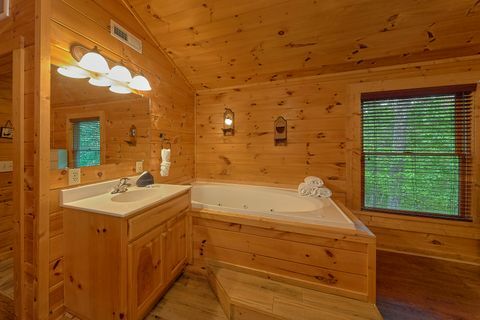 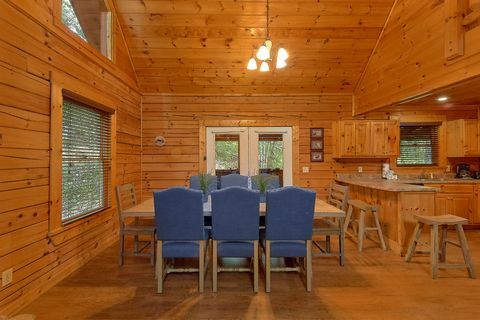 This Pigeon Forge 4-bedroom cabin features all the comforts of home and more! 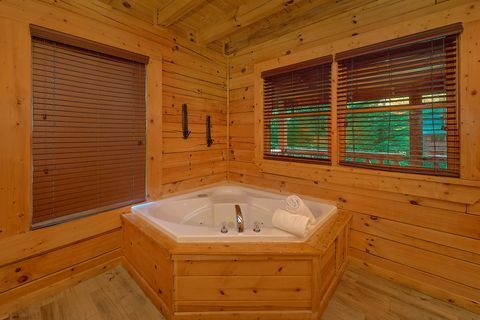 Upstairs, discover one of two master suites, which boasts an expansive king-size bed, in-room jacuzzi, gas log fireplace, television, and full private bath. 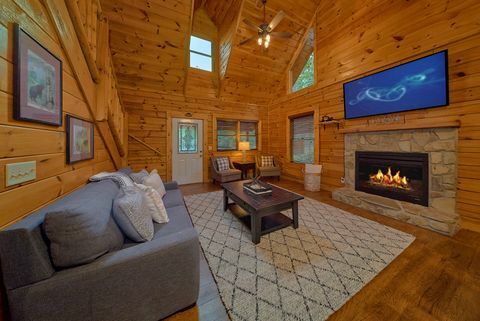 On the main level, guests can enjoy entertaining friends and family with a fully equipped kitchen, family dining area, and a welcoming living room with gas log fireplace. 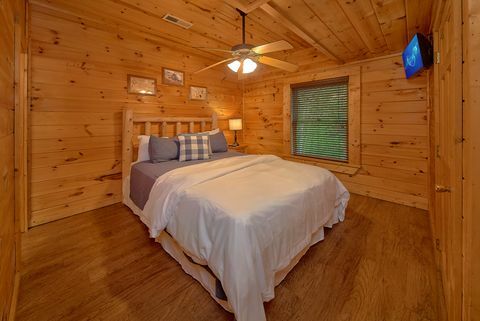 You'll also find a second master suite with king-size bed, in-room jacuzzi, television, full bath, and private doorway leading out to the hot tub on this level. 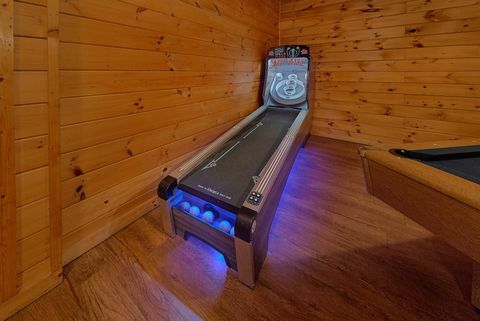 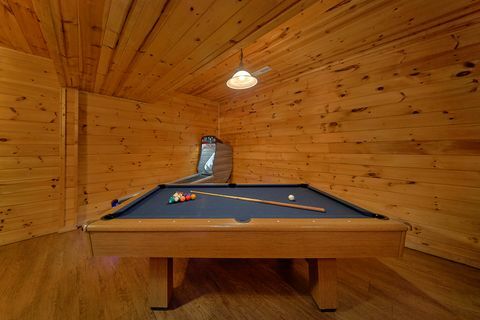 The bottom level of your group cabin in Pigeon Forge features a game room with pool table, television, and additional sitting area. 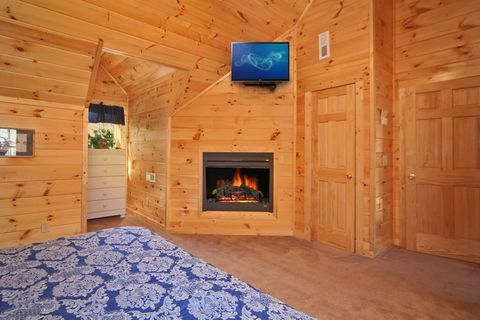 Two bedrooms are located next to the game room that each feature a queen-size bed, television, and full bath. 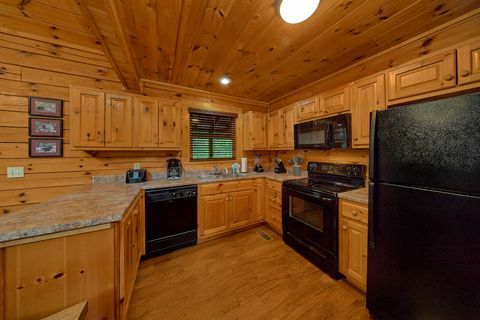 "Paws A While" rests conveniently near Gatlinburg and only a mile off the Pigeon Forge Parkway with plenty to see and do for the entire family. 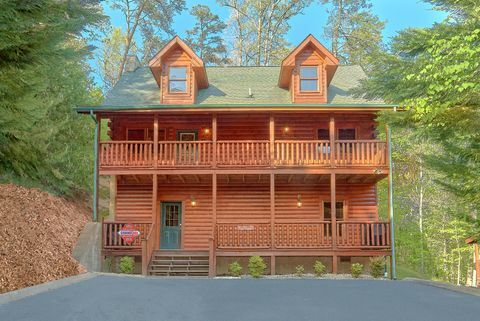 Visit nearby Ober Gatlinburg Ski Resort for some year-round indoor ice-skating or visit the shark tunnel at Ripley's Aquarium of the Smokies. 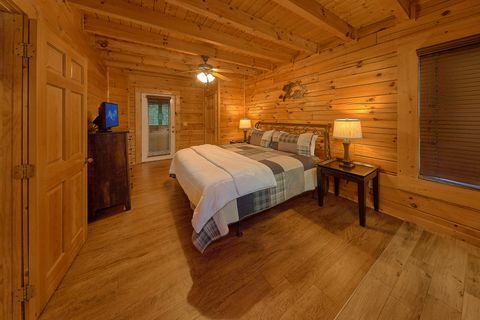 Reserve "Paws A While" or another Pigeon Forge 4-bedroom cabin online and get your immediate discounted Cabin Special with us at Cabins USA Gatlinburg!